“Yep! Head of a camel. Sort of... I thought more of a sheep, but one could say camel. Seen that. Long ago. It was in a small town in Germany where I lived with my granddad and grandmother. I don't think I was going school at the time but still old enough to remember. Must have been 1973/74, I reckon. There were two (still have now) churches, both Roman Catholic. The one on the main road used to be unlocked during daytime. My Nan went in (no other people in at that time) to say a prayer or to light a candle or both. I asked whether I could have a wander around to look at the wall paintings and figures of Saints in detail (that were everywhere). As long as I wouldn't "run" or make noise she said I could look around. So I did for maybe 5 to 10 min. My Nan was now chatting to a lady in a corner close to the altar. I was down the other end. On one side were all the confessionals. All empty of course at the time (or so I thought). Being a nosy little devil, I had to peep through one of the windows of each one...maybe 3 or 5 of these were there. 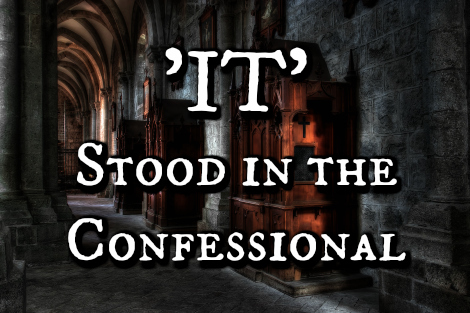 Just before the last one, I peep in and there IT stood at the place where usually the "confessor" would be seated. It kind of looked up at me... it looked dark, it wore a suit or something. I turned and ran. I was scolded for running (sh*tting myself I did, really scared). I told Nan to look into each confessional on way out. She did. She told me to look too to make me see there is nothing unusual. I looked. The "one" was empty too. But I could see the empty little bench in there (but IT stood. It never sat on anything). Clearly I could see the grey velvet seat cushion and on the cushion was a small book, like a prayer book. No book in the other alcoves. Of course, I didn't sleep for the entire week as we lived right next to the other Roman Catholic church. Still puzzled. To this day, I know I had seen something."